For decades, women have shouted from the rooftops, “Breakfast is the most important meal of the day. ” Yet, some how in the hustle and bustle of early morning activities, it’s also the hardest for me to implement on a regular basis. I know how important it is to get solid nutrients in our morning tummy and whole grains are a win-win in our household. There are so many health benefits to oatmeal, not to mention it’s a wonderfully frugal breakfast alternative. I have multiple recipes for easy baked oatmeal, and many of them taste like a sugary breakfast cake. It’s intent is a wholegrain, healthy baked oatmeal breakfast that most of my children really love (4 out of 5 ain’t bad ;). I have been preparing this since 1996, and have modified it over the years by adding seasonal fruit.You can mix this up the night before and pop it in the oven first thing in the morning. Seasonal fruit ( I have enjoyed strawberries, blackberries, blueberries, peaches, apples etc). Mix all ingredients together and pour into a 9×13 baking pan. One of my goals this school year is to plan my breakfasts more effectively. I’ll share as I master this. 🙂 If I don’t share…well, that’s your answer. I have heard of baked oatmeal but never tried it . . . what's not to like? This looks great, and I need help with breakfast, too. I'll look forward to hearing the ideas to come! I have had some baked oatmeal recipes that have totally bombed! Yours looks good though. I am trying to be on top of breakfast too! Well, first I am trying to be on top of getting up early… then we will get to breakfast, lol! delicious. we love baked oatmeal too – but I've never tried it this way. yum. I've never tried baked oatmeal either. But this really does look good and I like the idea of serving it with syrup! Thanks again for hosting Tasty Tuesday. I am anxious to try the baked oatmeal. Hubby is the breakfast cook during the school year. Perhaps he will work this into his menu:) Mister Linky for Crock Pot Wednesday is up and ready for your link. 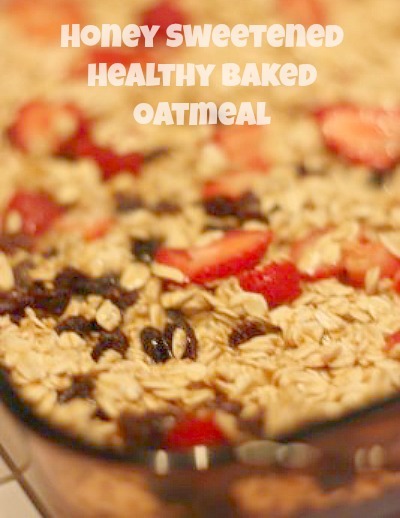 I'm not a huge fan of bowls of oatmeal, but I've been wanting to try baked oatmeal for awhile now. Yours looks yummy, especially with the fresh fruit. I think it's about time I give it a try! Crazy! I just made baked oatmeal for the first time ever this morning! My family gobbled it up! Loved it! I think i will make it again when my in-laws come to stay this weekend. Yay! I joined for the first time tonight! I love to check out what you have going on each Tuesday. Thanks for hosting! p.s. Wanted to make sure you got everything and that it was all in good order! Thanks again! Yum!! That sounds not only yummy but healthy too. I really must work on the breakfast thing this school year. I think this would be a good addition. This is awesome and I am totally stealing it. And I don't say that often. I guess I don't steal things often. You should feel good about this- I promise! I am guilty of eating flavored instant oatmeal. You have inspired me to try making a healthier home made version! It would work well with the few berries that trickle in from the garden. Sounds (and looks!) yummy! Mastering breakfasts is on my list for this school year as well. I have never tried this but have friends who love it. This looks great and with Autumn coming oatmeal is my go-to bfast! I'll try this! I must try this! My kids have been asking for oatmeal, the smushy instant kind, and I hate that stuff. This looks like it is really delicious. Thanks for sharing it! I made baked oatmeal several months ago for the first time – my two girls weren't big fans, but I loved it. Maybe I'll try it again b/c that looks yummy! Yummy! I want to try this. This sound wonderful!! I'll give it a try and see how the boys like it!! Thanks so much!! That just looks and sounds delicious! I'm definately a breakfast skipper but have been trying to get better about it. I'll definately be trying the baked oatmeal. My husband would love this recipe! I'll have to surprise him with it! Hmmm… I'm #56 and it should be titled (Blueberry Streusel Muffins) but it named it something else and I don't know how to change it… I'm so sorry!!! I love you blog! I couldn't make it without a good breakfast. This is a great solution for busy moms. I used to teach elementary school and so many kids came to school without breakfast or after eating donuts. They are at a disadvantage that way. My family hates oatmeal in the morning but may like this… it is a texture thing. 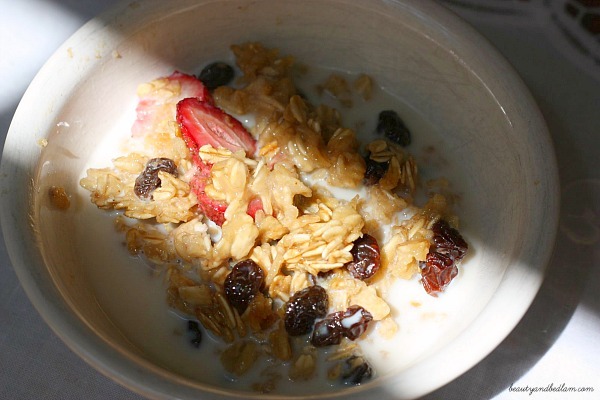 Mmmm…love us some baked oatmeal. Can't wait to try your version. The recipe I use is, indeed, quite sugary-cakeish! Love your blog and all of the great ideas you share. So, I tried your recipe for this this morning! 2 out of 3 of my kiddos enjoyed it. The baby ate is like crazy. We tossed in a bag of frozen blueberries. Thanks for sharing. The cinnamon and oats smelled yummy and fall-like baking! Mmmmm, I just saw someones comment about cookies. Wouldn't it just be over the top to toss in CHOCOLATE CHIPS??????????? One of the things I don't like about baked oatmeal is the mushiness of it. This one doesn't look that way, so I'll give it a try in the morning! Thanks for the inspiration. I am not an oatmeal eater. However, I appreciate you reminding me to put more effort into breakfast for my kids. We eat wonderful breakfasts on weekends but we usually just have cereal on the weekdays. Now that school is starting again, I am going to try to make breakfast at least 1-2 times a week. I am going to try this one, sounds good! Great recipe. I loved it. Shopping online with the discount coupons for oatmeal and other groceries are wonderful and it saved me big bucks. this week I am obsessed with tomatoes. This sounds great! I’m really glad it’s not as sugary as many baked oatmeal recipes. I want to use almond milk and add almond butter to it—I love the flavor of almond with oatmeal! Do you think it would work if I removed one egg and added 1/4 cup almond butter? I love almond with that as well and I definitely think it would work. It might not stick together quite as much, but with this recipe that doesn’t really matter if you just serve it in a bowl. 🙂 Let me know how it turns out. @Jen, I made the almond version and it’s wonderful! I used 1/4 cup almond butter (salted, but no sweetener in it), 2 cups almond milk, only 3 eggs, and about 1/2 tsp salt. I also sprinkled a tiny amount of raw sugar on the top. It held together well, had the right amount of moisture, and a lovely, subtle almond flavor. I highly recommend you try this version! Next time I might add 1/2 tsp almond extract, since I’m wild for almond flavor, but other than that it was perfect. I made this baked oatmeal today and it came out delicious! So glad you enjoyed it. 🙂 We love it too. thanks for sharing your recipes! Can you substitute quinoa for oatmeal in the baked oatmeal? Thanks. This was wonderful! Made it this morning. Kids loved it, too! We used frozen berries, and added chia seed and flax seed. Looking forward to eating it this week and not having to cook breakfast every day, what a time saver. Thank you! I love this recipe! I don’t like the texture of oatmeal but have been searching for a protein and fiber packed breakfast. I started substituting 1 cup of ground flax in place of 1 cup of oatmeal and it gives a more cake like texture. Regardless, the recipe is perfect without the flax too! I bake a 12×13 Sunday evening and eat it cold for breakfast all week. It is a quick, easy, healthy breakfast! Thank you for sharing. I am so glad to hear this and I love the flax substitute. I will have to try that. We also love it but I make mine in the slow cooker over night. You may have to experiment with the amount of water. I added a little extra to the usual ratio. We live in central Canada and some of us have to leave the house at 5:30 am. When it is 30C below I feel better knowing they are leaving the house with something warm in their stomachs on really cold mornings. I put several small (dollar store) jars of add- ins on the counter beside for variety. (raisins, slivered almonds, coconut, dried apples, protein powder). They unplug the slow-cooker and the later risers reheat their servings. (Gets kind of dry otherwise).